The term "Geistige Landesverteidigung" or "Défense Spirituelle" stands for the strong and widespread political will of the Swiss population to defend Switzerlands independence and democratic constitution against the Nazis. The common goal of national defense against Nazism united entrepreneurs and socialists towards the end of the 1930's, while they had waged bitter conflicts (class-struggle) during all of the 1920's. The term "Geistige Landesverteidigung" can be translated word-for-word from German as "mental (or intellectual) national defense", but a word-for-word translation from the official French and Italian versions ("défense spirituelle" and "difesa spirituale") as "spiritual defense", making a link to religion, probably hits the point even more precisely as I will show below in detail. Note that Switzerland has four national languages: German (spoken by 74%), French (21%), Italian (4%) and rumantsch (1%) of the native population. In the course of the 1930's the Nazi regime brought the German and Austrian press into line so that Swiss media remained the only German-language platform for public criticism on the Nazi ideology. For geographical and cultural reasons Germany was always the most important trade partner to Switzerland. As most other countries, Switzerland was still in an economic recession at this time while Germany boomed due to Adolf Hitler's industrial initiatives. So Switzerland's economic dependancy on its large neighbour Germany was even bigger than in normal times. This is the reason, why the Swiss government took some censorship measures, especially concerning external trade. However, the most important and in particular the successful newspapers came out with a clear demarcation against the Nazi regime. In 1931 Switzerland built three national radio transmitters - one in each of the three major language regions of the country: Beromünster (Central Switzerland: German), Sottens (Western Switzerland: French), Monte Ceneri (Southern Switzerland: Italian). 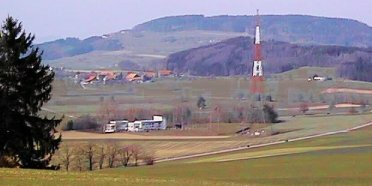 In 1937 the transmitter equipment and the antenna in Beromünster were upgraded and in 1941 a shortwave transmitter in Schwarzenburg was added, so that the program could be received well beyond the Swiss borders. Reliable information was important in a time when the German minister of propaganda Dr. Goebbels used radio as a premium medium to spread his Nazi-propaganda. Switzerland's National Public Radio (www.swissinfo.org) as well as the British Broadcasting Corporation (www.bbcnews.com) built up a reputation for independent information during World War II and both have kept up their professional standards since. Both stations did favour democracy and freedom, but instead of countering German propaganda lies with lies, they did not conceal successes of the German armed forces and the problems of the Allies in the first war years. So people in Germany and in occupied countries learned to trust in their news reports. The Nazi regime forbade tuning in to foreign stations. Together with the relatively free press (despite censorship) there were also satirical politcal shows attacking the Nazis: Die Pfeffermühle [the pepper mill] with the German political refugees Therese Giehse and Erika Mann preferred quiet tones for its performances in Zurich starting from 1933, yet the message directed against Adolf Hitler was quite clearly understood by the audience. There were numerous disturbances of the performances by supporters of Nazi friendly groups. The Swiss satirical showgroup Cabaret Cornichon [French: pickled cucumber] with Walter Lesch (artistic director), Otto Weissert (producer), Emil Hegetschweiler, Alois Carigiet, Billy Weilenmann, Mathilde Danegger, Toni von Tuason, Max Werner Lenz, Elsie Attenhofer, Zarli Carigiet, Margrit Rainer, Karl Meier, Albert Knöbel, Ludwig Donath, Hilde Herter, Helene Pastorini, Fritz Pfister and Voli Geiler offered programs with concise allusions starting already in 1934 in Zurich. The group also went on tour to other Swiss cities. Before the war, they could partly reach a German public when playing in Basel at the border. Several performances lead to diplomatic interventions by Germany, but the Swiss authorities did not prohibit them. Bert Brecht's pieces (among them Galileo Galilei and Der gute Mensch von Sezuan, both 1943) were played for the first time at the Zurich theatre - directed by German emigrant Leonard Steckel. Friedrich Schiller's drama Wilhelm Tell (written in 1804) was repeatedly played. From 1934 to 1936 a museum for the "Bundesbrief" [federal charter, a document dating back to 1291, considered to be some kind of "Switzerland's declaration of independence"] was built. In 1937 a historical path leading from Immensee to Küssnacht in central Switzerland (where the legendary national hero Wilhelm Tell is said to have killed a tyrannic bailiff early in the 14th century) was restaurated. Both national monuments were designed to demonstrate the decision of Switzerland to defend its freedom and independence. The National Exhibition [Landesausstellung, short affectionate dialect form: Landi] of 1939 in Zurich was originally planned as an industrial fair displaying latest "high tech" products like its predecessors in 1896 and 1914. However, the threat of nazism added a new dimension to it and the event is now remembered as the most popular expression of the phenomenon called "spiritual national defense". The themes "homeland and people", "our raw materials", "processing and sales", "distribution" and "culture of the spirit and the body" show the balance between economic industrial fair and national self statement. Overwhelming public success (10.5 million entrances compared to 4.2 million inhabitants) shows the broad response of the public. The spirit of this exhibition ["Landigeist"] has become legendary. This expresses, that the 1939 national exhibition was far more than just another event. Visiting the "Landi 1939" can be compared to a pilgrimage, the summit of which was the so-called "Höhenweg" [mountain trail] designed to strenghten national identity. Reports say that male visitors took their hats off as they would do in a church and people deposited flowers and coins at the feet of a statue named Ready for Defense (see picture) to express their willingness for sacrifice. (Isabelle Meier, Mythos Landi, p. 79) The "Landi 1939" is an unforgettable expression of "spiritual homeland" for this generation - a fact that can still be verified talking to Swiss people born before 1930. Switzerland's army has - apart from a few hundred military teachers - no professional soldiers, on the other hand every healthy man between 20 and 50 years (today: 40) is a soldier. In peace times soldiers are trained half a year and go to a 3-week repetition course every year. Basic training and repetition courses are being prepared by officers who are themselves not professional soldiers but do exercise a civil profession - as lawyers, technicians, salesmen, teachers, farmers, truckers etc. Therefore everyday life and military service are closely intervowen and a sharp distinction between civilians and soldiers is not possible in Switzerland. This is the background of activities of several Swiss army officers starting as early as 1929. They published booklets about the necessity for national defense, read papers for a broad public, wrote newspaper articles. The leading figures of this movement were officers of low rank - from ordinary soldiers to colonels. Captain Hausammann, a professional photographer tried to gain official support for films. Finally the film Füsilier Wipf [rifleman Wipf] was produced in 1938 by a private film company, the army commanders agreed to the assignment of army material and soldiers as extras only reluctantly. Another film Landammann Stauffacher, reflecting Switzerland's history, was directed by Austrian emigrant Leopold Lindtberg, who was also directing plays from 1933-1945 at the Zurich theatre. These "private" efforts were noticed and critized with official diplomatic protest by the Nazi regime in Germany. Immediately before the outbreak of the war, Swiss parliament elected Henri Guisan (representing Switzerland's French speaking minority) as general and commander in chief of the Swiss army. General Guisan formed a staff to strenghten the morale of his troops. Knowing that every move would be watched closely by Germany, General Guisan tried to keep these things low profiled and as unofficial as possible. So the officers that had engaged in these efforts during the 1930's were encouraged to continue but not given official orders. Although their lectures were public by nature, they tried to arrange them as parties with personal invitations. Existing social structures as trade unions, sport assiciations, women's associations (the army knew they needed support at home!) etc. were asked to mobilize their members. Interestingly enough, the majority of these lectures were given to members of socialist organizations and the initiative was even taken by the socialist movements that had strongly opposed the army until 1935. Stolz und tapfer wie die Ahnen! Proudly and courageously as your ancestors! Because the general is calling! (J. K. Schiele (editor), Globi wird Soldat [Globi becomes a soldier], Zürich: Globi Publishing Co., 1940, p. 4. Quoted after 8th edition, 1983. The Globi series of books have celebrated their 75th anniversary in 2003 and are still nearly as popular as Mickey Mouse among Swiss children. Globi is half a child, half a bird and preaches the morality of his mental father playing his tricks and making jokes - the kind of pedagogics Walt Disney used with similar success. You will not be surprised to learn that editor Schiele, who was as a civilian man manager of the Globus department store chain, was one of the Swiss Army officers that were very engaged with Spiritual Defense ...). The Socialists were the first to realize the threat by Nazism. The external threat helped to smoothe the path to communication between the employers and the trade unions and/or between the Radical Party [representing ideas more or less similar to U.S. Republican Party] and Social Democrats. Thus trade union secretary Konrad Ilg engaged the employers in negotiations and in 1937 the most important employers' association (machine and electrical industry) and the metal workers' unions signed a so-called "peace agreement": the employers respected the unions as partners for the first time, agreed to solve certain problems on the level of employers' association and unions (instead of individual contracts) and even accepted an arbitral body, while the unions renounced on any strikes. This agreement was also a clear move against conservative ideas of authoritarian state guidance of the economy as put into practice by fascist dictator Mussolini in Italy and by Adolf Hitler in Germany - and as supported by the catholic church. World War I had caused serious social problems: workers called to the military service earned no wages for several months. To solve this problem, a public insurance was introduced in 1940 that would pay 80% of the former wages to soldiers' families. The financing principle of this insurance (a deduction on wages to be paid half by the employee, half by the employer) worked well and was later adopted for social security introduced in 1948. New taxes on property and high incomes were raised to finance the increased defence expenditure. So liberals and conservatives made several concessions to socialist demands while the Social Democratic Party gave up their opposition to the army and supported national defense since 1935. The Creed of Switzerland's "Civil Religion"
Government member Philipp Etter (Catholic Conservative Party) formulated the central content of the so-called Spiritual National Defense in the 1938 Proposal of the Swiss government to the parliament concerning the organization and the mission of preserving and promoting Swiss culture (already this title is very suggestive, especially if translated word for word!). "The Swiss credo was expressed thus: «the idea of a Swiss state was born neither of race nor of the flesh, it was born of the spirit. There is something magnificient, something awesome about the fact that this tremendous idea should have [celebrated its incarnation and have] led to the creation of a state whose heart is the Gotthard, the mountain that sunders [the waters running to the Atlantic, the Mediterranean Sea and the Black Sea] and the pass that connects [northern and southern Europe and the German, Italian and French cultures]. It is a European, a universal idea: the idea of a spiritual community of peoples and Western civilisations!» According to the message, this was «nothing other than the victory of the spirit over the flesh on the rugged terrain of the state»." Anybody familiar with the Christian tradition will immediately recognize herein the concentrated use of religious key terms: creed, incarnation [see in the Bible: gospel of John 1,1-18], the contrast "spirit vs. flesh" is a central topic of the Christian teachings (see gospel of Matthew 26.41 = gospel of Mark 14,38; gospel of John 3,6; St. Paul's letter to the Romans 2,28f quoting the prophet Jeremia 4,4; Romans 7,5f; Romans 8,3ff; letter to the Galatians 5,17). Furthermore, the expressions "not based on race" and "victory of the spirit over the flesh" in this official document are a clear refusal to the racist Nazi ideology. If there ever was such a thing called civil religion [creation of national identity through religious rituals, totems (flag! ), myths, "holy places" (national museum founded in 1936 = a shrine for the charter of the Swiss Confederation, and the building did indeed look like a church inside!) etc.] shared by the whole Swiss nation, then it was this phenomenon called "spiritual national defense" at the eve of and during Wold War II.